What's the weather in Reykjavik like? Well, there is a saying in Iceland: “If you don’t like the weather right now, stick around for five minutes”. This is a clear indication of a changeable climate, and more often than not, travelers will experience the four annual seasons in the span of a day. Actually, the weather in Reykjavik is milder than its close proximity to the Arctic would imply. The weather is mostly cool with a temperate climate. This is due to the moderating effect of a branch of the Gulf Stream that flows along the southern and western coast of the country. Sea temperatures can rise as high as 10 degrees Celsius at both the south and west coast. There are a few deviations in the climate in different parts of Iceland. As a rule of thumb, the south coast is warmer, but also windier and wetter than the north. Heavy snowfall is common in the northern regions. 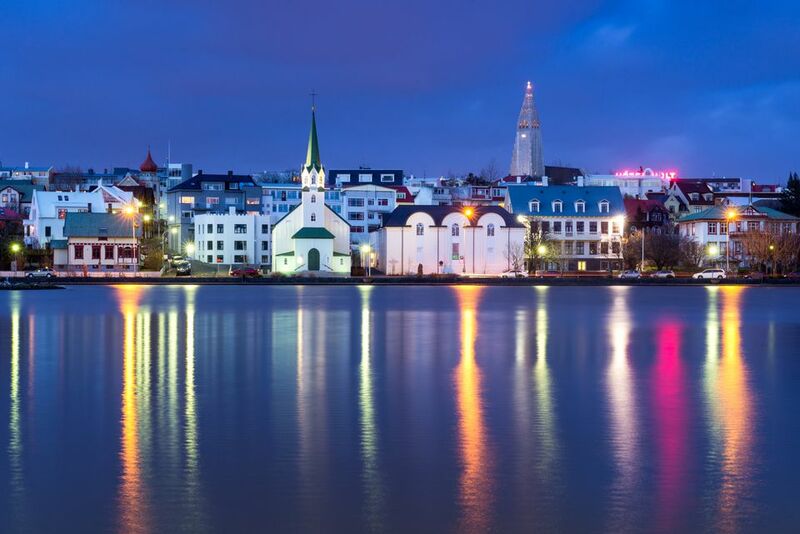 Reykjavik is located in the southwest, and the coastline is literally dotted with coves, islands, and peninsulas. It is a large, spread-out city, with suburbs stretching far out into the south and east. Reykjavik’s climate is considered to be sub-polar oceanic. Even if the temperature hardly drops below –15 degrees Celsius in winter, thanks once again to the moderating effect of The Gulf, the city is prone to gusts of wind, and gales are not uncommon in the winter months. The city offers little protection against the ocean winds, and even if Reykjavik is a beautiful travel destination with considerably milder temperatures than expected, tourists from sunnier locations will consider it cold. Many of us will not forget the impact that Iceland's 2010 volcanic eruptions had on a global scale. The massive ash cloud that was emitted in the atmosphere saw airspaces closing for days. In addition, the eruption led to melting ice, and Iceland was subject to massive floods right after the initial disaster. However, Iceland has been touched by many, many natural disasters in her existence, and authorities have managed the situations successfully and efficiently. Areas in the danger zone will be evacuated at the first sign of activity, so do not let the slight possibility put a damper on your trip. Spring typically arrives in April, as temperatures warm up and days get longer. While balmy temperatures won't arrive until June—or sometimes even later—visiting in spring is a smart idea for travelers. It's shoulder season, which means good deals for savvy travelers who want to beat summer's rush of tourists. Spring is also a prime season for fishing, whale watching, and golf. What to Pack: Iceland's unpredictable spring weather means you'll want to be prepared for many different types of weather. Must-packs include a rain jacket, a packable down coat or jacket, a fleece vest (for layering), thermal tops and pants, and waterproof hiking boots. Iceland's summer season runs from June through September and can be surprisingly warm. Temperatures usually average around 57 F (14 C), but highs up to 68 F (20 C) aren't unheard of. Summer is also Reykjavik's driest season; on average, the city receives around a 3/4 inch of rainfall per month during this time. Visiting in summer has another perk: Iceland is one of the Lands of the Midnight Sun. As you would rightfully assume, this means that there are virtually no periods of darkness during the midsummer months. What to Pack: A summer packing list isn't too different than packing for spring or fall in Iceland—you'll still need your coat, base layers, and waterproof footwear—but other smart additions to your suitcase include sunglasses and high-factor sunscreen. If you wish to enjoy your trip to the fullest, and at the best rate, take advantage of early fall, just after the high tourist season in summer. In addition to relatively good weather, the daylight hours are still long, with distinguishable sunsets. Temperatures dip a bit in September and October, but it's still a great time to visit. The season marks the beginning of Northern Lights Season, and the city plays host to many film, art and music festivals. What to Pack: At the risk of sounding contradictory, remember to bring your swimsuits—even in the fall. Swimsuits? In winter? In the Arctic? That’s right. Reykjavik is famous for its natural year-round hot springs. Regardless of what time of year you are traveling, the hot springs are an absolute must. The height of the cold months lasts from November to April, with average daily temperatures of 39 F (4 C). The coldest period is typically towards the end of January, with highs of around freezing point. Temperatures are surprisingly similar to cities like Hamburg or New York City. The winter climate is actually very bearable, as long as the wind keeps a low profile. Almost the direct opposite of summer's non-stop daylight, winter sees a period of Polar Nights, where the sun rises around lunch time and sets again in the afternoon. What to Pack: Winter can be gloomy to the uninitiated, but discovering and exploring this unique country will be well worth the initial discomfort. For the more cold-blooded among us, a sturdy heavy jacket or coat along with all the winter trimmings will be sufficient to keep you snug. Additionally, don't forget wool socks, thermal base layers, and lip balm. Along the southern edge of the Arctic Circle, you can see the aurora borealis (or Northern Lights) regularly in Iceland, making the country one of the best places in the world to catch the phenomenon. The best chance to see the lights is from late September through late March. The Northern Lights are not visible from mid-April through mid-August due to another unique phenomenon: the Midnight Sun. During late spring through summer, Iceland experiences nearly continuous daylight. It never fully gets dark during this period, instead of looking like a dusky sunrise.